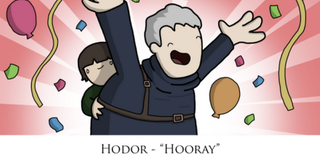 Artist James Chapman depicted Game of Thrones characters as the autocorrected versions of their fantastical names, and the results are funny and delightful. Chapman, a physics Phd student and the author of Soundimals: An Illustrated Guide to Animal Sounds in Other Languages, found that his phone’s autocorrect kept interfering when he messaged friends about GoT. He told us the suggestions varied almost every time, so he started writing them down and soon compiled an “insane” list. “It wasn’t a shining endorsement for the phone, but it certainly gave me something fun to draw,” Chapman said. His favorite character to portray was Hodor, because it’s a pleasure to draw anyone looking so happy—especially considering this cast of characters and season 5’s relentlessly dark tone. All men must value mirrors. You can follow James Chapman on Tumblr, Twitter and Facebook.